Recurvirostra avosetta Linneaus, 1758, Italy. Monotypic. 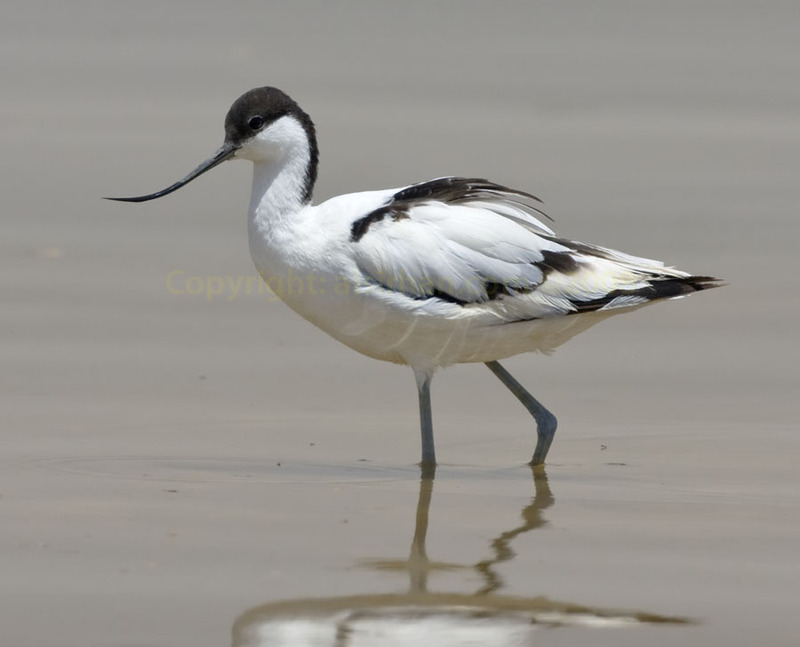 English: (Eurasian) avocet; French: Avocette йlйgante; German: Sдbelschnдbler; Spanish: Avoceta Comъn. 16.5–17.7 in (42–45 cm); 7.9–14 oz (225–397 g). Distinctive, black, strongly upcurved bill and long-blue gray legs. Plumage white with black forehead, crown to beneath eyes and nape and upper hindneck. At rest has three black bands on mantle and wings. Female bill shorter with stronger curve. Juvenile resembles adult but black plumage tinged brown and white upperparts have brown or gray mottling. Europe through western and central Asia to southeastern Siberia and northeastern China, through northern Africa to eastern and southern Africa. Winters from western Europe and Africa through Middle East to northwestern India and southeastern China. Breeds in dry and sparsely-vegetated flat, open areas, usually shallow saline lakes, lagoons and estuaries, up to 9,840 ft (3,000 m). 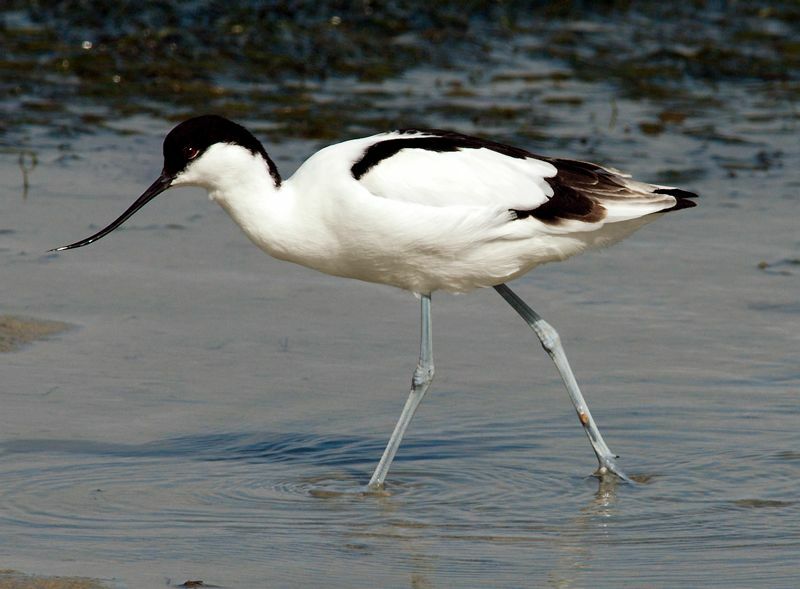 Outside of breeding season found in muddy tidal flats, rarely at freshwater lakes and rivers. 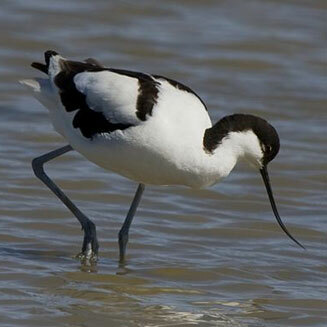 Mostly feeds by picking, also scything, takes variety of aquatic invertebrates. Winter diet dominated by worms, will feed by sight on the siphons of mollusks. Sometimes feeds communally. Breeds April through August, nests in large colonies. Nest is a grass-lined depression in open ground or short vegetation. Lays three to five eggs, brownish with dark spots or blotches. Incubation 23–25 days, by both sexes, fledging 35–42 days. 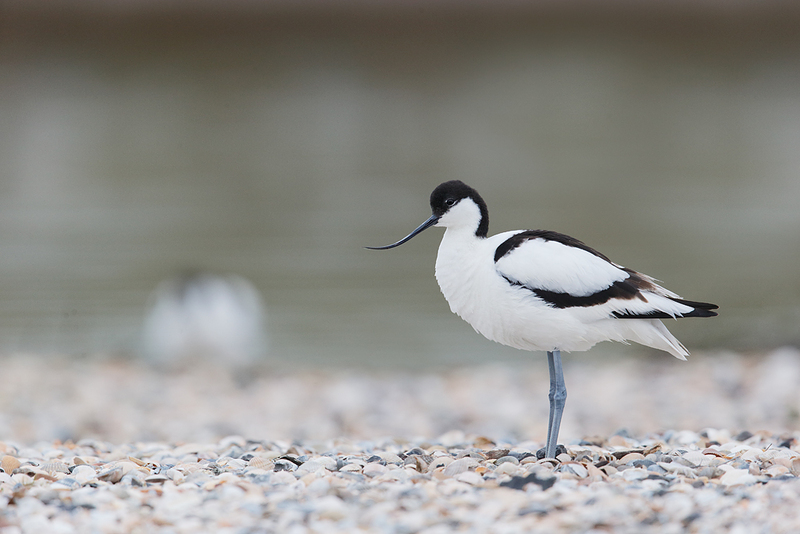 Conspecific nest parasitism documented, parasitic eggs laid earlier in the season into nests of other pied avocets. Known to have lived over 24 years in the wild. Not threatened. Has rebounded from range contraction in northwestern Europe in 1800s, number of breeding pairs in Europe estimated at 31,000–56,000 with greatest numbers in Denmark, Netherlands and Spain. Less opportunistic than other recurvirostrids, this is cause for concern as pressure on wetland habitat increases due to lack of protection and contamination from pollutants including selenium. 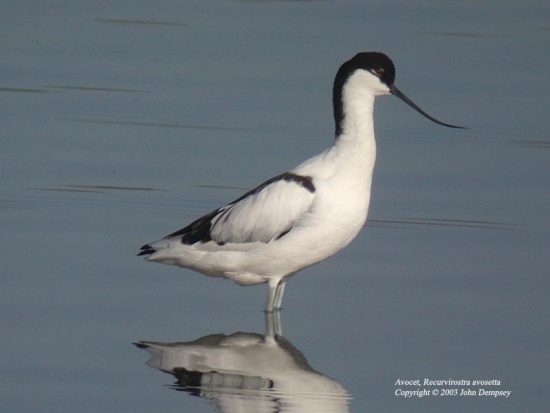 During successful conservation effort of early 1900s in Europe, the pied avocet was adopted as the Royal Society for the Protection of Birds’ symbol, and the image is strongly associated with ornithological conservation.